Marvel Studios LLC is adding “Avengers: Infinity War” — what it brands as the most ambitious crossover of all time — to its nearly 10-year onslaught of superhero films. The studio packs dozens of superheroes and villains into the film, the 19th release in the Marvel Cinematic Universe since “Iron Man” premiered in May 2008. 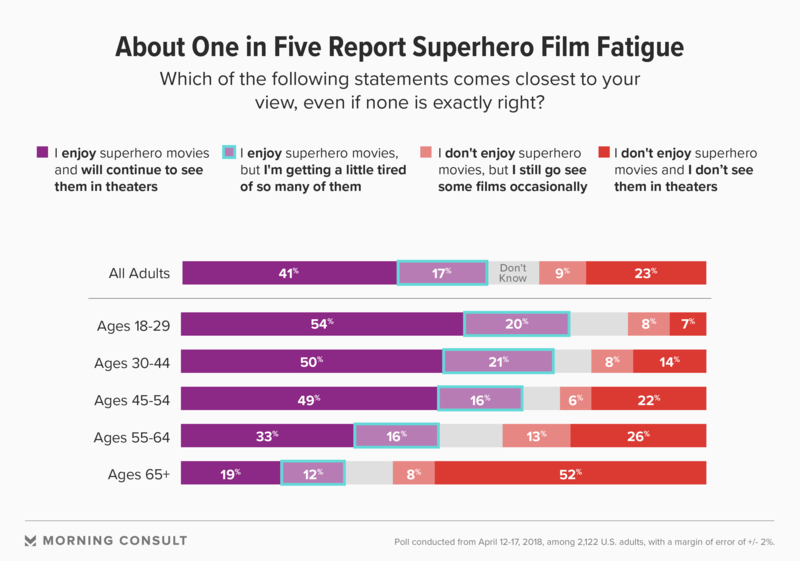 But a new Morning Consult survey shows the public hasn’t grown tired of superhero films, and they won’t anytime soon, experts say. Indeed, theater chains such as AMC Entertainment Holdings Inc. have reported strong advance ticket sales for “Infinity War,” premiering in the United States on Thursday, raising expectations that the movie’s opening weekend in North America could dethrone 2015’s “Star Wars: The Force Awakens,” which generated a record $247.9 million in its first weekend. Studios would be smart, however, to continue diversifying its leading characters to freshen up the genre and bring in new audiences — a move, according to the survey, that the public would applaud. A 41 percent plurality of U.S. adults said they like superhero movies and will continue to see them. The April 12-17 poll was conducted among 2,122 U.S. adults with a margin of error of 2 percentage points. Experts push against the idea that audiences are tired of superhero films. Three of the top 10 highest grossing films last year were superhero films: “Guardians of the Galaxy Vol. 2,” “Justice League” and “Spider-Man: Homecoming.” And five of the top 10 most lucrative opening domestic weekends of all time were superhero films. One reason for the explosion of superhero films is that technology, namely computer-generated imagery, or CGI, has finally made it possible to portray these characters in all their superhuman-ness. “There’s a pent-up demand for superhero films that’s been building since 1938 and 1939, when Superman and Batman came along, and it’s kind of exploded here in the 21st century,” said Jonathan Kuntz, a lecturer at the School of Theater, Film and Television at the University of California Los Angeles, in an interview on April 19. Jeff Bock, a senior box office analyst at Exhibitor Relations Co. Inc., an entertainment research and data company, said theaters love these films because they get people off their couches — and streaming devices — and into theaters. “The superhero genre screams: ‘Go to the movie theater and see this film,’” Bock said during an interview on April 19, crediting the films’ larger-than-life narratives and the communal experience of cheering on familiar characters. Young adults, ages 18-29, in particular are enthusiastic about superhero films. They’re the only age group in which a majority said they love such films and will continue to see them, according to the survey. Only 7 percent said they don’t enjoy superhero movies and don’t see them in theaters, compared to nearly one-quarter of the public who said the same; however, one in five young people also said they’re a bit tired of such films. Experts said one way to draw in new audiences, and reverse possible superhero fatigue, is to diversify leading characters. Of the Marvel Cinematic Universe and DC Extended Universe superhero films, only one has a headlining female lead character, and only one has a title non-white lead character. Headlining more diverse lead characters has been fruitful for studios. “Black Panther,” Marvel’s first film with a title black character, has brought in about $681 million domestically and $1.32 billion worldwide since its February release. Black Panther earned $202 million its opening weekend in North America, making it the fifth-largest domestic opening ever. DC’s “Wonder Woman,” released in June 2017, brought in more than $412 million in the domestic box office and nearly $822 million worldwide. “Certainly, it’s an attempt to bring in different audiences, and it’s an attempt to do something different,” Hancock said of lead character diversification. And audiences want more of it. Specifically, the public wants more female superheroes. According to the Morning Consult survey, 36 percent said there should be more female title characters in superhero films, while 5 percent said there should be fewer, creating a net of 31. Notably, Democrats are more than twice as likely as Republicans to say there should be more female leading title characters, and Democratic women are more than two-and-a-half times as likely as their GOP counterparts to agree. And while respondents overall were more likely to say there should be more black, Hispanic and Asian superheroes than they were to say there should be more white characters, there are sharp partisan divides. Republicans are as likely to say there should be more white superheroes (net 9) as they are to say there should be more black superheroes (net 9). Republican men are the most likely of any demographic subgroups polled to say there should be more white superheroes leading films. Studios may be wise to feature a Hispanic superhero in their next blockbuster, experts said, as the group is overrepresented among frequent moviegoers relative to their proportion of the U.S. population. Twenty-four percent of frequent moviegoers, or those who go to a movie theater at least once a month, are Hispanic or Latino, according to the Motion Picture Association of America’s 2017 Theatrical and Home Entertainment Market Environment report, while constituting 18 percent of the population overall. Especially if studios more aggressively embrace diverse characters, experts agreed that superhero films aren’t going anywhere. Correction: A previous version of this story misstated Kuntz’s time reference to the recent popularity of superhero films.